While I was away from blogging, I put very little effort into getting dressed in the mornings. Life was getting weightier by the minute and coming up with a fresh new outfit each day was at the bottom of the list. In fact, it might have even fallen off the list altogether. An outfit template that simplifies my life and never fails? I’m in. Now, with the history of Unfancy, you might think that I sat down at the table, created a Uniform Planner, and lovingly wrote out detailed descriptions of uniform possibilities. Because — weighty life stuff. Instead I just kind of noticed what I was reaching for again and again. And then I gave myself permission to just keep wearing them. A fitted top tucked into high waisted jeans with booties. If it’s super chilly outside, I add a slouchy sweater coat + close-toe booties + socks + a wool hat. 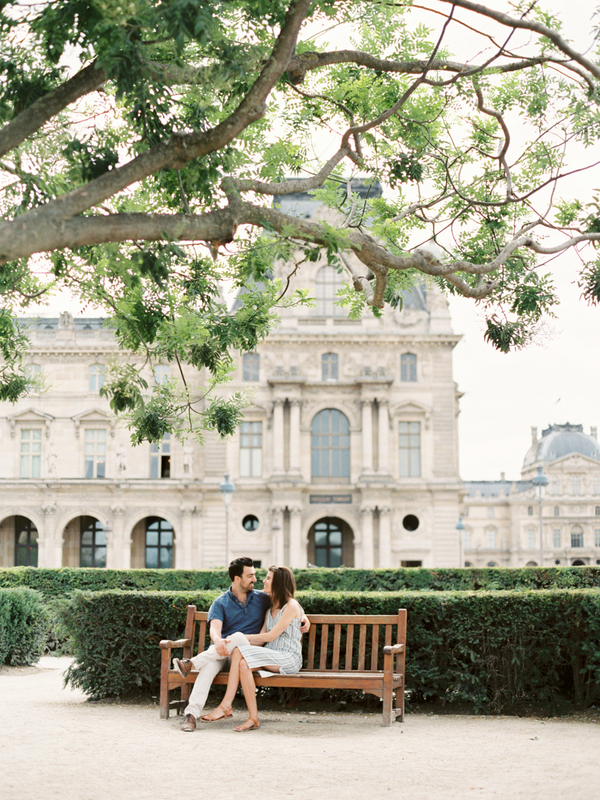 Do you find yourself reaching for the same kind of outfit again and again? What’s your go-to uniform? Black or grey leggings, a long top or sweater dress, my tall brown Frye Boots, and a tassel necklace. I have been relying heavily on that combo to get me through the colder months and am dreading when legging season is over. Yes!! I wear the same one of three outfits every day! 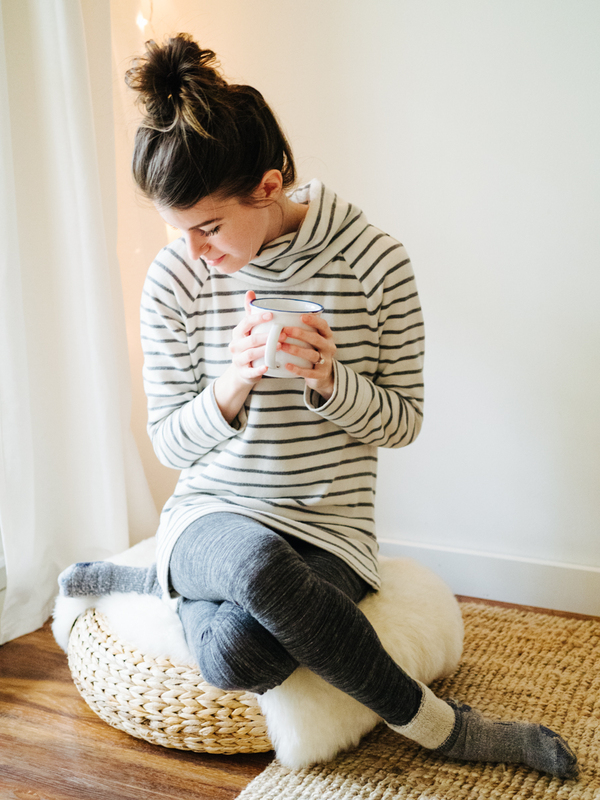 Lululemon leggings (black or navy), black puffer vest, long layering tank, and one of two black or striped shirts/sweaters that cover the booty. My 11-year old wears the same two pairs of pants and one sweater from her 37 piece capsule, and I swear she only wears six things total and constantly interchanges them. When clothes fit and feel well, why change it?! Great post!! I love that you have your daughter using the capsule – was that yours or her idea? I have my two pre-teens home sick today and they are about to get on Caroline’s site. I think this might be a really fun project for them. Skinny jeans tucked into knee boots, t-shirt with vest or cardigan, and a scarf. My WV winter uniform always starts with my mid-calf black leather boots and straight legged jeans. Then I choose either a bulky sweater or a v-neck tee under a boyfriend cardigan. Hello! It’s great that you are back. The uniform which I am totally over: Leggings, booties, t-shirt and sweater or sweater and vest. It was cold here in LA and now it is 85 degrees. Layers work best. Sometimes, I will add a long piece of jewelry. I am never quite comfortable in my clothes though. Like you, I appreciate the utility of a great ” uniform”. I do sincerely wish you and your family all the best! As a homemaker, my uniform for the school run is jeans (skinny or boyfriend), t-shirt and converse. love those booties — are the same ones in your special occasion capsule? dif. color? My uniform consists of skinny jeans, any top (t-shirt or blouse) with some jacket. Blazer, moto, etc. Aw man. Messed up the signature. Love the new style of the blog! It’s very clean and creative. And the new style of pics! More natural feeling. I like it. So glad you’re back and posting! Welcome back ! I know these past months have been tough as my sister faced breast cancer and lived with me through that journey and I’m pleased to say that was 13 years ago and she’s gone on strength to strength and become a court judge :) She is my inspiration. Like most everyone here, my uniform consists of black or grey jeans, v neck t shirt, scarf, jacket, and slip on shoes (clogs or loafers) along with my pearls, diamond pendant, earrings, tennis bracelet and watch – I feel nekked without jewelry ;–). Makes week day dressing easier for sure and the layers are a must for the weather here in the SF Bay Area. Right now my uniform is just staying warm. Lots of layers and boots. I’m eager for warmer weather to dress normal again!.. (not just for warmth). I have two pair of the same Athleta leggings, two TekGear tops(different colors) and a comfy but sleek pair of Bass ankle boots that I’m gravitating towards when not at work. In the winter especially I’m drawn to what is comfortable but I refuse to be frumpy. I’m SO GLAD you’re back Caroline- missed you much but kept with everything that I learned from you while you were away. Looking forward to the ride as you continue on your journey. So happy to have you back!! I love the new website, and the wardrobe #1. I’ve been wearing a very specific uniform, too (the there’s a new baby and I’m nursing all the time uniform). I cycle through my 3 (amaaaazing) Tradlands flannel shirts, sometimes multiple times a day, given my son’s spit-uping. Right now I’m at the awkward 2 months post-partum not fitting into my pants yet, but sad to keep wearing maternity jeans. And extra sad maternity leggings with holes in them… basically, psyched about my tops, needing some new bottoms, not wanting to buy anything since my body, she’s still a’changeing. I love the uniform! But… can we talk about the rug in the first picture? Is it yours? If so, where did you get it?? We just bought a house and I’m searching for a good rug. Hi Caroline! Just wanted to let you know about a little glitch! If you click on that photo of you and Steve that says “Hi I’m Caroline, I’m glad you’re here” it takes you to unfancy.com/about instead of un-fancy.com/about. So happy to see you’re back! I’ve been going through your posts and starting my own capsule. I also love the new look of your site! All the best to you and your family. I don’t have a go to uniform but I do find myself reaching out for my white/grey tees and denim shirt dress A LOT in the summer times. So easy. All I need to do is to change up the shoes for a bit of variety. skinny jeans, v-neck tee, flannel shirt. with tidy booties if i’m going out, or just plain timberland boots if i’m around here. we live a rural life, and the pieces just work best for toddlers, dogs, errands, housework, woods, etc. High-waisted skinny jeans (black or dark blue) + tan cropped t-shirt + whatever shoes the weather/activity calls for (comfy ankle boots for most days, wedges when I’m wanting to feel spiffy). If I really want to mix it up, I wear my light brown high-waisted skinny jeans and a navy cropped t-shirt. If it’s cold, I add a denim shirt or sweater and beanie. If it’s too hot for skinny jeans (most of the year here in Austin), they get swapped out for a super stretchy comfy navy pencil skirt – I have yet to find a pair of shorts that doesn’t ride up and require constant shorts-crotch-pulling-downage. The new look of the blog is a-mah-zing! Well done friend. Love the outfit! So comfy! Oh most definitely! I’m now a SAHM so I’m in jeans, a gingham button up with the option to toss on a loose turtleneck sweater and my most favorite accessory…a blue cashmere beanie which I stole from my husband. I have two of the same suede naturalizer booties in black and a brownish color. That is my wardrobe and I’m sure my husband would burn it if h could, lol. My go-to uniform is a denim shirt, black skinny jeans (yes, double denim!) and Converse. Comfortable, simple and relatively stylish. This new layout is amazing! I love your blog aesthetic! Such a nice post! By the way: My uniform now in winter is a pair of tights with a black mini skirt and an oversized sweater. I am a bit unhappy with it though, so I am hoping for spring to change things up again. First of all, your new design a absolutely gorgeous Caroline, i’m really feeling a lot of good vibes from this place ever more than before, congrats! Also, i’m definitely a uniform kinda gal, especially this winter. Basically the same 3/4 outfits are circling in the washer from one week to the next! I’m pretty sure i won’t change them until next season now! Whatever weighty life stuff is in your orbit right now, just know that your readers greatly appreciate you and your talent. I’m sure that won’t solve or resolve anything going on in the category that is “weighty”, but it is true and kind and sometimes those things can patch up the dam for an hour or so. Yes! Right now mine is similar, though in MN it calls for something a little warmer. Usually a slim turtleneck tucked into jeans! And booties without the cute peep-toe. I love this! Found your blog maybe two years ago – I think through Jess Lively. Loved it from day 1. So happy to see that you are settling down in a routine and that your precious Mama is whole and well. Prayers of healing were answered. Thank you Lord!! 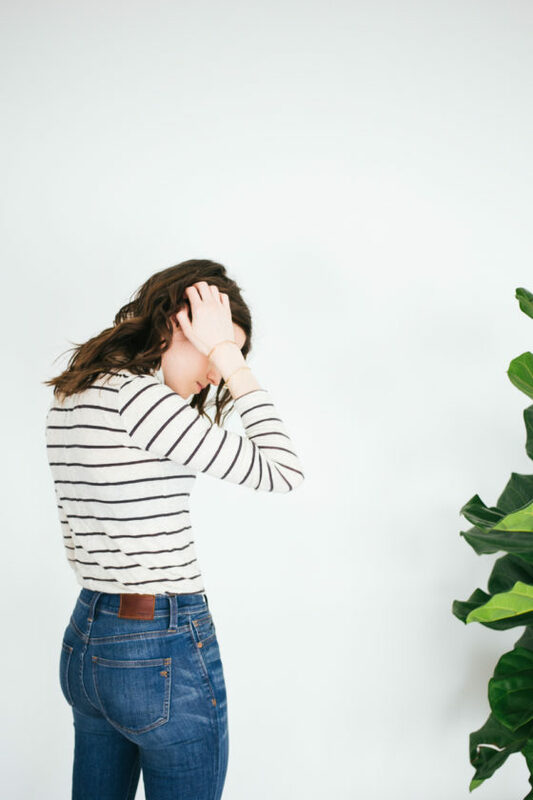 Since embracing the heart of minimalism for several years, but still moving to each day in baby steps, I have really enjoyed the tangible success of the capsule wardrobe. For me living in the mid-Atlantic, winter is in full swing. My uniform for outerwear is my black puffer coat, Sorel boots and gloves/hats/scarves. I have been wearing my JCrew skinny jeans, Everlane v-necks and sweaters to layer on top. I need to purchase some more long sleeve t-shirts, black skinnies and another pair of jeans as these ones are probably going to give out after everyday rotation for over a year! I also would love to get a boyfriend cardigan or a cashmere cardigan. I like thin layers. For shoes – I usually wear Sam Edelman booties – best purchase 2 years ago – on your suggestion – cognac brown!! I also like button down blouses – like chambray and flannel, but lately its been the cotton t-shirts with layers that I have reached for. Its a good time to evaluate my wardrobe again as we’ll be moving soon. PS the new site is amazing!! Your creativity is such a gift!!! Thank you for sharing it with all of us!! Welcome home!! Very happy to see you’re back. My uniform is a printed skirt, black top, black tights, boots. i typically wear jeans (1 of 4 ranging from skinny, to boot cut, to straight to cords), a blouse-type top and layered with 1 of 4 cardigans (ranging from loose to long to fitted to bulky), then it’s ballet flats or ankle boots. I’m so glad you blogged about this. I definitely use the uniform method for sure. I’ve never been one to think too hard about what I wear with what I already have. However, when I shop I look for stuff that will go with my favorite pieces. Right now, even though it’s not warm yet I reach for leggings and tank tops. I run hot most of the time so to layer with a tank gives me the option to peel back so I can cool off. I’ve also been wearing the same water proof thermal boots all winter long since I got them in November, which is great because I live in the Pacific Northwest and not having to worry about getting wet feet puts me at ease. My wardrobe is not big, but I rotate through a few short sleeved shirts, my tanks paired with a pullover sweater, and once a while I’ll wear a button up flannel, but at the end of the day it’s all I need. i am just so happy to read your posts! i missed your take on everything! I never used to wear turtlenecks until my mom handed some down to me. Now it’s all I seem to reach for in the morning! Yea!!!! So glad you’re back. And so happy to hear you’re mom is doing well. I’m on my third capsule and loving it. I do three a year and keep them 4 months. Works better with the weather here. It’s either winter or summer. Just want to let you know how much you’ve influenced my life. From capsule wardrobes I’ve moved on to simplifying and minimizing. I’m finding more time to start embracing things I used to dream about!! You made switching to a minimal wardrobe so easy, it made me want to make other areas of life simpler. Thank you! Definitely appreciate this look and the idea of a uniform. When life gets busy, I think we all need to give ourselves the option of finding freedom in a uniform. As of late, mine is a big comfy knit, wool hat, and ankle boots! 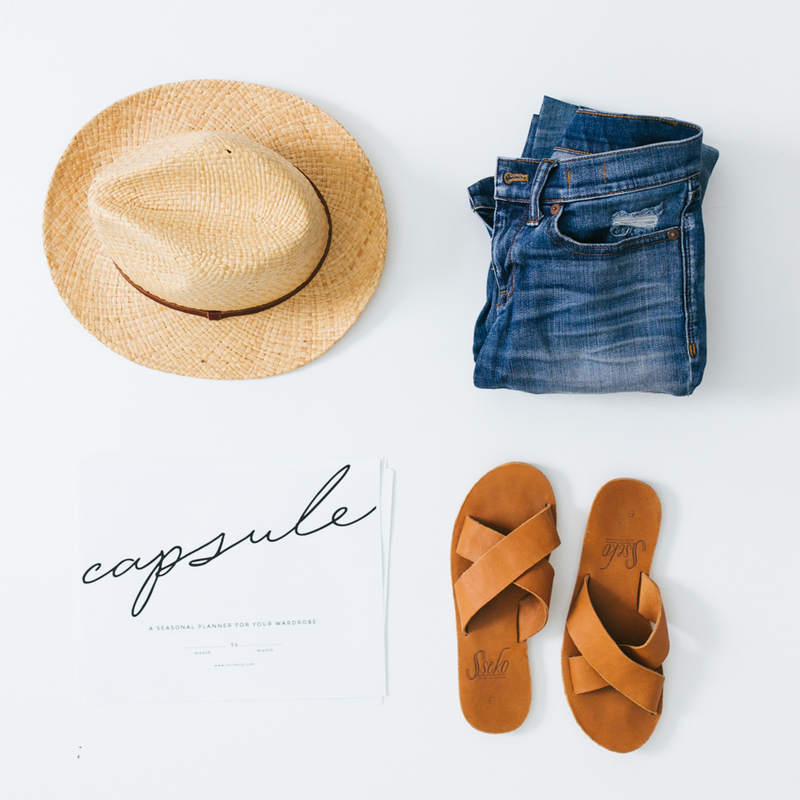 I’m a reader from sweden, i found your blog while reading up on capsual wardrobes (i’m on my second capsual now, yay) and I’m so glad you started blogging agin. My uniform are a striped longsleeved tee, a cardigan and a streachy skirt (or jeans if is less cold than it is here right now). I could wear this everyday! I just firstly wanted to say I am so happy and excited that you are back. I also absolutely love what you have done with the website! 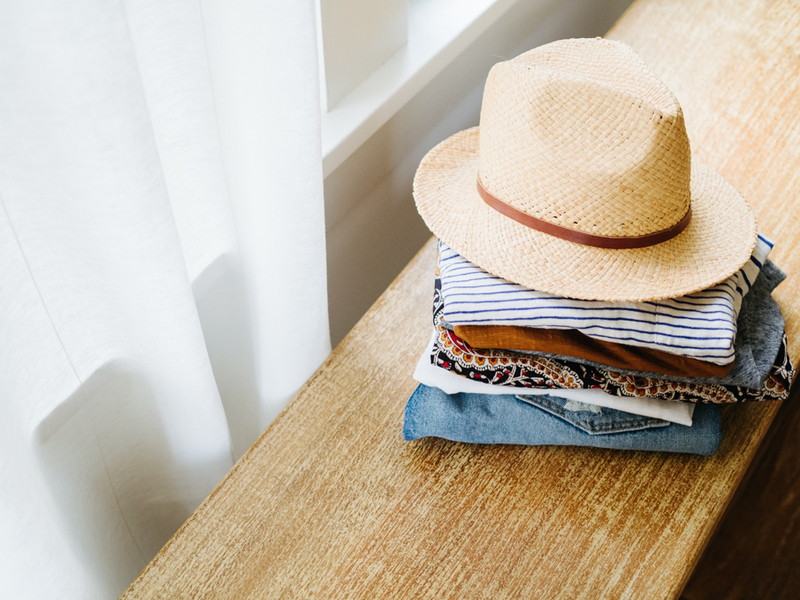 I loved following your Capsule Wardrobes so I was interested what would happen to Unfancy when you came back and it is amazing! I cannot wait to see what else you write on. I just love the way you write. Simplistic, I love it! I tend to wear my black high waist jeans a lot with any one of my tee shirts and ankle boots. To mix it up, I like to wear either a silk scarf, a statement necklace, or bright lipstick. Black high waisted jeans, black and white striped shirt, and converse! That’s pretty much my work uniform. I love being up early, but getting up early is a completely different story. Sleeping in is much more important to me, so a uniform is a necessity! Working from home has me wearing the same uniform everyday: jeans, tennis, and a comfy slouchy sweater with a nice necklace. I gravitate to what makes me smile when I put it in on. There are days I’m so ready to wear my black skinny jeans and a basic black Zara blouse (black uniform is first choice). Then there are days I need a “shocking color” so I wear my bright red blouse with a hue of pink with a loose black pants and printed sleeves jacket. Whatever helps me feel approachable and fun, I’m in it. I can very much relate to the back story of your post – my dad was very ill for a long time and passed away 2 years ago – I was lucky enough to be able to spend his last month at home with him and my mom, but I had literally 5 mins to throw some things in a bag before I went – I ended up with 2 pairs of skinny Jeans, 3 simple long sleeve tops, 2 cardigans and a denim shirt…. and literally wore these things only for a whole month (and I was out of the house every day as my dad was in hospital/hospice). I was feeling crappy enough anyway and my uniform made me feel a bit more comfortable with myself. This made me seriously rethink the size of my wardrobe (amongst a lot of other things….) and I have downsized a lot since then. I just found your blog for the first time, and I am so glad I did! Your style really looks comfortable, polished, stylish, and casual at the same time. It reminds me of the women I’d see when traveling in Amsterdam and Paris. What is your location? I started downsizing my wardrobe last year, and much more seriously in the past month. I am a single mother of two, a part-time nurse, and a full-time student (again). I was overwhelmed by the clothes stuffed in my closets, and never looked put-together despite tons of nice clothes. I gravitated towards jeans and t-shirts every day. So I got rid of all the trendier items that look nice, but I don’t wear. I pared down to 40 items for a winter capsule, and I am investing in some better quality clothes. If I truly want to wear jeans and t-shirts most days, why not upgrade to jeans and tees that fit and look great? And top it of with a great shoe? I love looking in my closet now and seeing a small handful of items that are very neutral to mix and match and a few pops of color. It’s so much easier to get dressed and the clothes are all comfortable. I love it. I had no idea dressing could be so easy!!! Less really is more. One suggestion: When I click on your “see my past capsules” link, it doesn’t show all the capsules. I looked at this page about a half dozen times before I noticed the “12 older posts” at the bottom of the page. It might be more streamlined and visually appealing to have all these posts on one page. 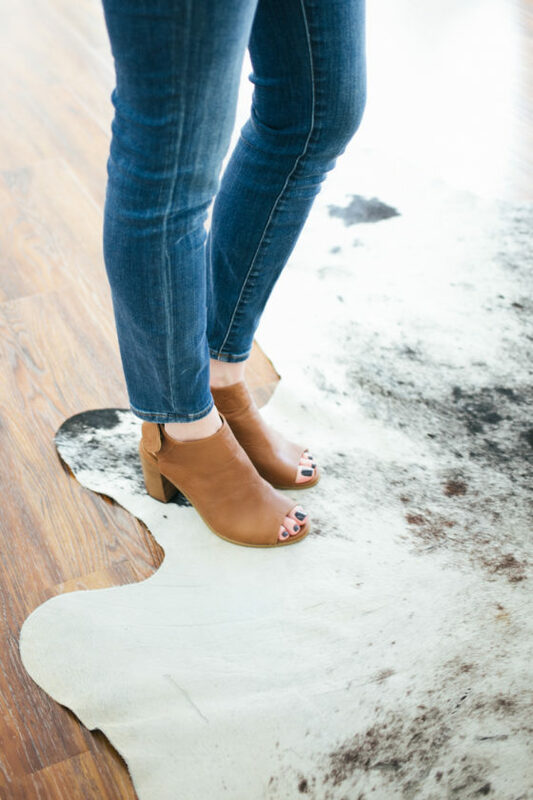 I am getting major miles out of my $50 black ankle boots this season. They are starting to show it, so as the Missouri temperature moves to warmer days I am on the look out for peep toe heels that can take over. Most definitely have a uniform! New mom, online student, and middle school teacher means I don’t have a lot of time to come up with new ways to look good. Skinny jeans + tank or graphic tee + flannel for the weekend. Skinny trousers or jeans + tank + button down or sweater for work. It just works. I don’t really have a uniform but I just wanted to say that I am so glad that you started blogging again!!! I have several uniforms that recur week after week. (1) BF jeans rolled up, black tank, a scarf or sweater, booties or chucks or ballets (2) LBD with stretch, lace up ballets (3) distressed cutoffs, loose tank and havianas. That is pretty much what I wear week after week (well #2 is only for evening plans like dinner). When I hop to another island to visit my BF, it’s easy to pack now because it’s always a variation of the above. This is my weekend uniform, except my shoes are lace-up ankle boots. I can’t wear jeans to the office, except on Fridays and I usually work from home on Fridays. But I do have a pair of denim blue chinos that I wear to work when I feel like wearing jeans. So happy you are back! Love the look of the blog. I don’t have a capsule yet but my work uniform would be mainly Eileen Fisher basics in black, navy or gray with a jacket or sweater and booties. 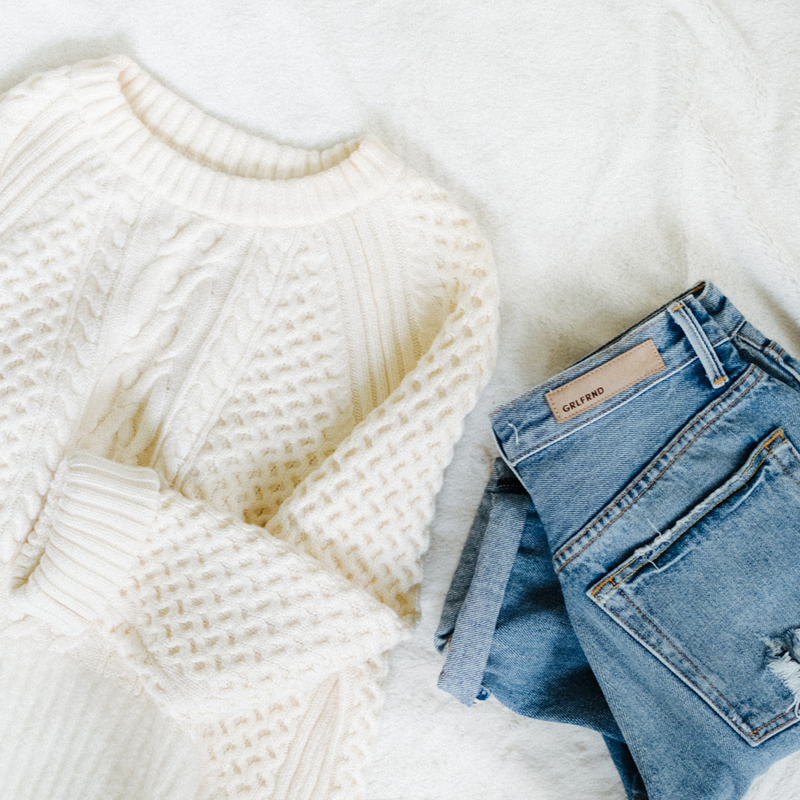 On the weekend jeans and a sweater or tunic. Easy and effortless. For this past winter, I have constantly been wearing this silent + noise fuzzy sweater from urban outfitters, black jeans, and steve madden ankle boots. It’s the warmest outfit ever! Love the evolution Caroline. Fashion must function within the bounds of what is going on in our lives. Hell yeah to the uniform. It’s exactly the next step beyond the capsule “diet” to truly finding what you feel great in, knowinh your perfect proportions and effortlessness. It’s how Europeans have been doing it (especially the French) forever. The uniform speaks to a certain refinement in taste and confidence in wearing your clothes. I’ve moved on to the uniform because my life is hectic and the capsule was too much planning. I’d rather focus that energy on food planning! I have a uniform for work and a uniform for not-work. So easy, so stress free. Not to mention the savings – I just worked my uniform from what I already had. It’s like capsule meets Marie Kondo. Looking forward to how you develop yours. Glad you are back online. I follow very few bloggers and I missed you. I definitely have a uniform, no shame in that! High waist skinny jeans & a silk button down shirt. Switch out the bag & shoes depending on the occasion, top with a leather jacket or wool coat depending on the weather. I am also glad to see that you are back! I’ve missed your beautifully simple posts. One question about the new website – I’m having trouble finding the button that will take me to the next post. The only way to see the post after this one is to either hit the back button or home button, and then click on it. I’m excited to see what’s in store for the blog! My uniform lately consists of a utility jacket + black or grey sweatshirt, black skinnies and my beloved Vince Camuto Quilted leather combat boots. On warmer days I ditch the boots for my fav Nike Internationalist trainers. YES! Definitely! A big yes! As my days are basically shaped around the kids and taking them to and from school, I have the same uniform for the 5 schooldays of the week. I’m wearing these over and over again for 40 minutes in the morning when I’m driving them to school and another 40 for picking them up. Wide leg pants (the ‘office’ kind, only with a considerably low waist – wool for colder seasons and linen for warmer days), sneakers, a long tshirt tucked in. A scarf. ‘done and done’ . The same crossbody mini messenger bag, the same sunglasses. Enter denim jacket for frisky mornings or leather jacket for even friskier. When it’s raining, black rain boots, black leggings, a long belted black jacket with high collar. ‘done and done’ . Yes, uniforms are such a blessing! I’m so glad you’re back! I’ve missed your blogging.